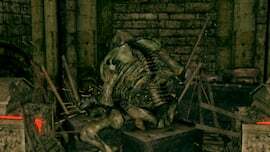 Blacksmith Vamos is a Character in Dark Souls. He is found in The Catacombs, working as a blacksmith and serving player with various upgrades and ammunition. Despite the somewhat violent introduction and the suspicious appearance, Vamos will not harm you unless attacked first. He can ascend fire weapons to +5 by default. Giving him the Large Flame Ember will enable him to ascend fire weapons to +10. Giving him the Chaos Flame Ember will allow him to ascend +5 fire weapons to chaos weapons. See the Upgrades page for more information regarding weapon upgrades. This Blacksmith is accessed through The Catacombs. After the first bonfire, continue along the level until you come to a spiral staircase that breaks off. Carefully walk (NOT roll) off of the bottom of the stairs, staying against the outer wall - there is a platform directly below. From there, you should see another platform (with a lootable corpse) ahead and below; then you can safely drop to the bottom. Step into the hole there and you'll be greeted by a cut-scene of Vamos approaching you and smashing out a wall, suggesting it would be best if you left else you might cause him to lose his focus. (The cutscene will save your character from an otherwise lethal fall should he or she be lucky enough to fall directly into the hole from higher up, but this is beyond risky.) Vamos will remain here unless killed. Be careful not to accidentally lead any of the wheel skeletons just outside into his nook - they'll kill him pretty fast, due to their attack style. Vamos can be tough to kill at low levels, but at higher levels he shouldn't put up much of a fight. He's fairly slow with mostly close quarter attacks, and his only weapon is a Pickaxe. Although he is a large special character, he can still be parried and backstabbed. His smithy is a bit cramped for fighting, so it can be beneficial to clear out the wheel skeleton pit first, and then fight him there. Sometimes most of his attacks will not hit at all when in range, apart from the spinning attack (bug?). If he dies, you can pick up his hammer, "Hammer of Vamos." Anyone else get the feeling that the elusive blacksmith deity is in fact Vamos? He seems to be trying to keep a low profile, and the Royal helm seem&apos;s to relate to Anor Londo. And the blacksmith deity would likely know how to use the chaos ember, as he was alive when the primeval lords were in power. The only other connection I can make is his stature, but he&apos;s not far from the tomb of giants, so that&apos;s not really solid evidence. Any other ideas? Whoever wrote this wants you to die you should definitely roll off the staircase or you’ll miss the platform. "Be gone with you. You&apos;ll disturb the bees in my voicebox!" Why did they use a toaster to record his voice lines? thats a powerful stance vamos has in the thumbnail pic. ... is there any way to get to him without jumping around? It sounds like there’s a pit of wheel skeletons that can kill vamos, so there has to be another entrance, right?